OK, so what the f*ck is a huckabee? Is it some type of hayseed-insect that likes the sound of its own buzz? Or then again is it something to do with a sexual act between humanoid and repletion? Hmmm. Maybe these chaps might know? Director: David O Russell; or Actors: Jason Schwartzman, Dustin Hoffman, Jude Law, Naomi Watts, and Mark Wahlberg. But only in 2004 and for 106-minutes. Open space activist, Albert Markovski (Jason Schwartzman), has a problem with coincidences. You see, over the last couple of days or so, he had bumped into the same tall African chap on three separate occasions. Therefore, to clarify what is happening to him in a rather unconventional way, Albert goes to existentialist detectives, Bernard and Vivian Jaffe (Dustin Hoffman and Lily Tomlin), so that they can trail him in his daily activities. Pretty peculiar thing for him to ask for, I'm sure that you'll agree. However, is it as peculiar as some of the people that the Jaffe's then meet, when they begin to investigate Albert's case? For example, there is Brad Stand (Jude Law), the smooth-talking sales-man, who gets Albert thrown out of the 'open spaces' collision to further his own career. Or there's Brad's Huckabees model girlfriend, Dawn Campbell (Naomi Watts), who Albert has a secret crush on. Maybe? Maybe not? Nevertheless - though - I can firmly state that none of these people are as peculiar as Tommy Corn (Mark Wahlberg), a fire-man who has a distain for all things petroleum related. Moreover, Tommy is also the person that the Jaffe's assign to Albert, just so that he can keep Albert focused within these rather depressing times. Ooops! Bad Idea. Well, lets just say that Tommy is what I would call a rather hot-head individual all in all. And he aides Albert in stealing his case file from the Jaffe's, just so that he can get to the bottom of who is African chap really is. In addition to this, once this revelation is revealed, they both then meet the Jaffe's existential nemesis, Caterine Vauban (Isabelle Huppert), whom takes Albert and Tommy under her wing, and then shows them her way of looking at things. Fair enough I suppose. Because that's what the Jaffe's do to Brad and Dawn later that same day, making their lives just as... errrmmm... can I say the word 'peculiar' again? Ha! Why not! Just like why what next transpires is a rather lofty and resonate affair indeed. As a client fall for his teacher - Shania Twain becomes a special feature - a fire seals unfrequented love - and when it matters most, push does come to shove. Never the end. But never the beginning. By the side of my bed I have a solid pine cabinet. It's not too big. It's not too small. It's just the right size for me to put my stuff in, although the top is rather dishevelled and scratched due to the wear and tear of time. For quite a few months now I have thought about re-varnishing the top, just to make it look brand spanking new again. Though if I did, would that imply that I don't like to see nature's blemishes, and I would rather have things near me look very pristine, cosmetic, and polished? Also, what would that say about me in turn? Too cosmetic? Too deep? Too over-analytical? OK, I am sure that you are wondering to yourself why I am telling you this tale about my bedroom furnishings, and the by-products thereof. Well, it's my way of illustrating to you how I feel about 'I Heart Huckabees'. It seems common in nature. It comes across both bold and benign in execution. And overall it is something that will be playing on the back of my mind for some time to come. You see, to be completely honest about it, this movie is not what I would call your average adventure story. The tale is mumbled. The pretext is highfalutin. The exposition is top-heavy. The underlining message is surreal. And the only thing that makes it any good, is that its a really nice picture to follow with great actors. For a start, all of the cast are really great to watch, with each and every one of them possessing a character trait that is both associative and expansive with hindsight. Jason plays the down on his luck shmuck as if he had the zest of life sucked out of him. Jude plays the pretty-boy gone-bad in his own sardonic way. Naomi really shows her stuff (in more ways than one), playing the airhead with some inner conflicts to a tea. You can tell that Dustin, Lily, and Isabelle, are really have fun with their wise 'sensei' type roles. And as for Marky Mark - boy-oh-boy - he really does steal the show. This is the best I have seen him since 'Boogie Nights'. He's nut-tastic. 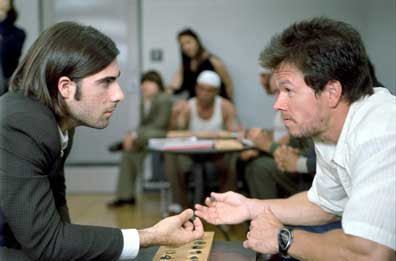 Here, check out some of these 'I Heart Huckabees' facts for some of this films back-story: (1) In Spain this film was called 'Strange Coincidences'. Plus many Anglo-Saxon speaking cinemas mistakenly labelled this film 'I Love Huckabees'. (2) Although they were originally cast to star in the Robert Altman 'Popeye' movie together, this was the first time Dustin Hoffman and Lily Tomlin worked on the same project. (3) This was one of the first films to be shot with Anamorphic Wide-Angle Zoom lens. (4) This is Jonah Hill's film debut. He got the role because Dustin Hoffman's children thought that he was funny, and so they introduced him to their Dad. (5) Gwyneth Paltrow, Nicole Kidman, and Jennifer Anniston, were all at one time or another associated with his film. Britney Spears also auditioned twice for it too. (6) Jason's Schwartzman's mum, Talia Shire, plays his mum in this flick. Also, Dustin Hoffman's son, Jake, plays the hotel valet. (7) Dustin Hoffman's character was based on Uma Thurman's Dad, Robert, who mentored the Writer / Director of this film, David O. Russell, whilst he was studying religion at University. (8) Two videos leaked out on the internet showing Lily Tomlin initially arguing with David O. Russell, and then screaming at Dustin and Naomi Watts. In response to this, Lily said 'Adults have fights and go through stuff. I know some people are more dignified in the world, that if you transgress against that kind of professionalism, that it's some kind of great sin. But I don't see it that way'. (9) The Governor of Arkansas, Mike Huckabee, didn't like this movie; he thought that it was too improvisational. Which funnily enough was something that David O. Russell allowed the actors to do, when he kept the camera's rolling in-between scenes. (10) It was Jude Law who contacted Shania twain to star in this flick. Overall 'I Heart Huckabees' is a fairly nice film. It's overt in places, and subtle in others. But by in large it's like a philosophical discussion come to life, all performed by a really great 'all-start cast' of guys and girls of varying demeanors. Moreover, it is also like a meditation which compares sociological issues and metaphysical issues, giving the impression that these two polar-opposites are more alike under deeper scrutiny. Agreed chaps? Oh! And it's funny at times too, ha!